Download "State Disability Insurance Laws"
1 State Disability Insurance Laws State disability insurance benefits are also called temporary disability insurance benefits and short-term disability insurance benefits. Currently, only five states provide or require employers to provide short-term disability insurance benefits. The chart below summarizes information regarding each state s requirements, compiled from the agencies responsible for administration of the benefits. California State Disability Insurance Program (SDI) includes: Disability Insurance Provides affordable, short-term benefits to eligible workers who suffer a loss of wages when they are unable to work due to a non work-related illness or injury, or due to pregnancy or childbirth. Paid Family Leave Established for workers who suffer a loss of wages when they need to take time off from work to care for a seriously ill child, spouse, parent, registered domestic partner, or to bond with a new minor child. Mandatory employee payroll deductions. The SDI withholding rate for 2014 is 1 percent. The taxable wage limit is $101,636 for each employee per calendar year. The maximum to withhold for each employee is $1, Benefit Amounts for State Disability Insurance maximum weekly benefit amount ($1075) an individual must earn at least $25, in a calendar quarter during the base period. The daily benefit amount = weekly benefit amount divided by seven. The maximum benefit amount is 52 x the weekly benefit amount or the total wages subject to SDI tax paid in the base period, whichever is less. Exceptions: - Employed individuals who elect SDI coverage, the maximum benefit amount is 39 times the weekly rate or the total wage credits in the base period, whichever is less. The minimum weekly benefit amount is $51 for DIEC participants. - For residents in a state-approved alcoholic recovery home or drug-free residential facility, the maximum payable period is 90 days. (However, disabilities related to or caused by acute or chronic alcoholism or drug abuse which are being medically treated do not have this limitation.) Benefit Amounts for Paid Family Leave maximum weekly benefit amount ($1075) an individual must earn at least $25, in a calendar quarter during the base period. The weekly benefit amount = approximately 55 percent of earnings up to the maximum weekly benefit amount up to six (6) weeks of Paid Family Leave insurance benefits during a 12-month period. 2 Voluntary Plans California law allows employers or a majority of employees to apply to EDD for approval of a Voluntary Plan (VP) for the payment of Disability Insurance (DI) and Paid Family Leave (PFL) insurance benefits to their employees in lieu of the mandatory State plan coverage. To be approved for a VP, the employer must post a security deposit with the EDD to guarantee that it meets all obligations of the VP. luntary_plans.htm Elective Coverage California s Disability Insurance Elective Coverage (DIEC) program is available to small business owners, entrepreneurs, or selfemployed individuals. Individuals that are covered by the DIEC are covered by the Disability Insurance and Paid Family Leave programs. Employed.htm Once a VP is approved, the employer is no longer required to send SDI withholdings to EDD. Instead, the employer holds the contributions in a separate trust fund to pay Disability or PFL insurance claims and approved expenses. The VP employer pays an assessment to EDD based on the taxable wages of employees participating in the plan and other factors. For calendar year 2014, DIEC premiums are based on your net profit reported in 2012 Internal Revenue Service (IRS) Form 1040, Schedule SE or Schedule C. Each quarter, one fourth of this amount is reported as wage credits. The DIEC premium rate for 2014 is 3.67 percent of the first $101,636 in net income. The premium includes contributions for the Disability Insurance and Paid Family Leave programs. The benefits and rights under a VP must equal to or exceed the State plan in all respects and provide at least one greater right or benefit than provided by the State plan. Benefit Amounts for State Disability Insurance maximum weekly benefit amount ($1075) an individual must earn at least $25, in a calendar quarter during the base period. Your daily benefit amount is your weekly benefit amount divided by seven. Your maximum benefit amount is 52 times your weekly benefit amount or the total wages subject to SDI tax paid in your base period, whichever is less. Exceptions are as follows: - Employed individuals who elect SDI coverage, the maximum benefit amount is 39 times the weekly rate or the total wage credits in the base period, whichever is less. The minimum weekly benefit amount is $51 for DIEC participants. - For residents in a state-approved alcoholic recovery home or drug-free residential facility, the maximum payable period is 90 days. (However, disabilities related to or caused by acute or chronic alcoholism or drug abuse which are being medically treated do not have this limitation.) Benefit Amounts for Paid Family Leave maximum weekly benefit amount ($1075) an individual must earn at least $25, in a calendar quarter during the base period. Your weekly benefit amount will be approximately 55 percent of your earnings up to the maximum weekly benefit amount. You may receive up to six (6) weeks of Paid Family Leave insurance benefits during a 12-month period. 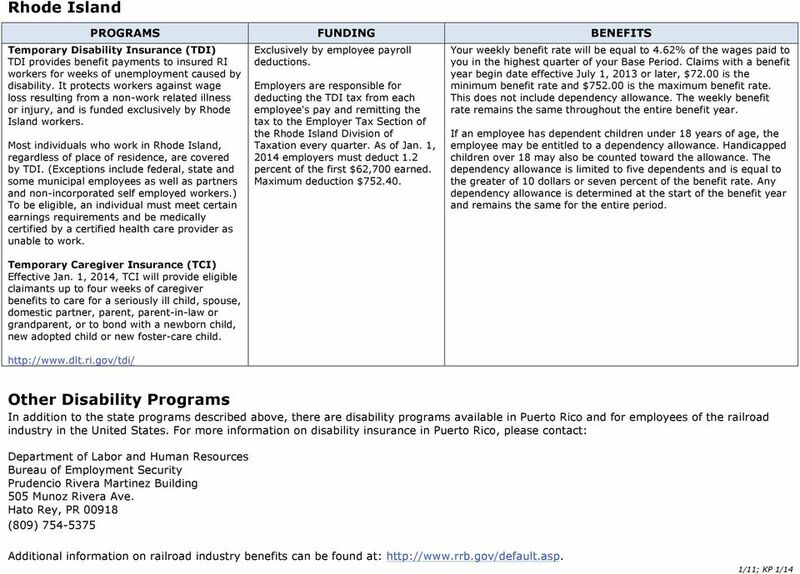 3 Hawaii Temporary Disability Insurance Requires most employers to provide partial "wage replacement" insurance coverage to their eligible employees for nonwork-related sickness or injury (including pregnancy). If an employee is unable to work because of an offthe-job sickness or injury and that employee meets the qualifying conditions of the law, the disabled employee will be paid disability or sick leave benefits to partially replace the wages lost. TDI does not include medical care. 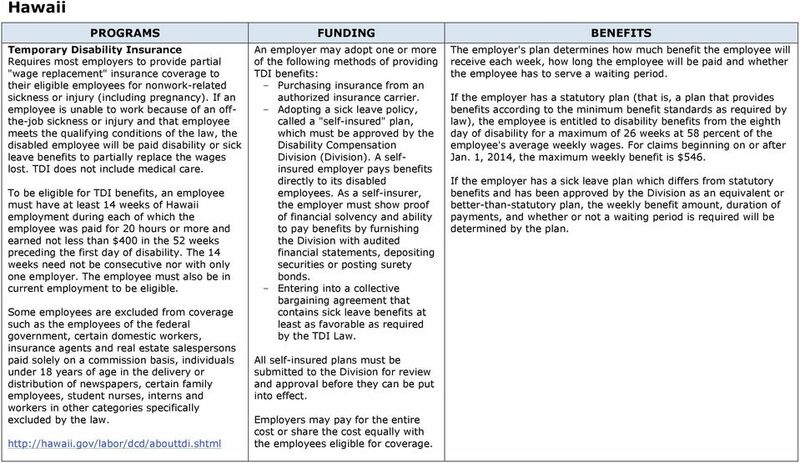 To be eligible for TDI benefits, an employee must have at least 14 weeks of Hawaii employment during each of which the employee was paid for 20 hours or more and earned not less than $400 in the 52 weeks preceding the first day of disability. The 14 weeks need not be consecutive nor with only one employer. The employee must also be in current employment to be eligible. Some employees are excluded from coverage such as the employees of the federal government, certain domestic workers, insurance agents and real estate salespersons paid solely on a commission basis, individuals under 18 years of age in the delivery or distribution of newspapers, certain family employees, student nurses, interns and workers in other categories specifically excluded by the law. An employer may adopt one or more of the following methods of providing TDI benefits: - Purchasing insurance from an authorized insurance carrier. - Adopting a sick leave policy, called a "self-insured" plan, which must be approved by the Disability Compensation Division (Division). A selfinsured employer pays benefits directly to its disabled employees. As a self-insurer, the employer must show proof of financial solvency and ability to pay benefits by furnishing the Division with audited financial statements, depositing securities or posting surety bonds. - Entering into a collective bargaining agreement that contains sick leave benefits at least as favorable as required by the TDI Law. All self-insured plans must be submitted to the Division for review and approval before they can be put into effect. Employers may pay for the entire cost or share the cost equally with the employees eligible for coverage. The employer's plan determines how much benefit the employee will receive each week, how long the employee will be paid and whether the employee has to serve a waiting period. If the employer has a statutory plan (that is, a plan that provides benefits according to the minimum benefit standards as required by law), the employee is entitled to disability benefits from the eighth day of disability for a maximum of 26 weeks at 58 percent of the employee's average weekly wages. 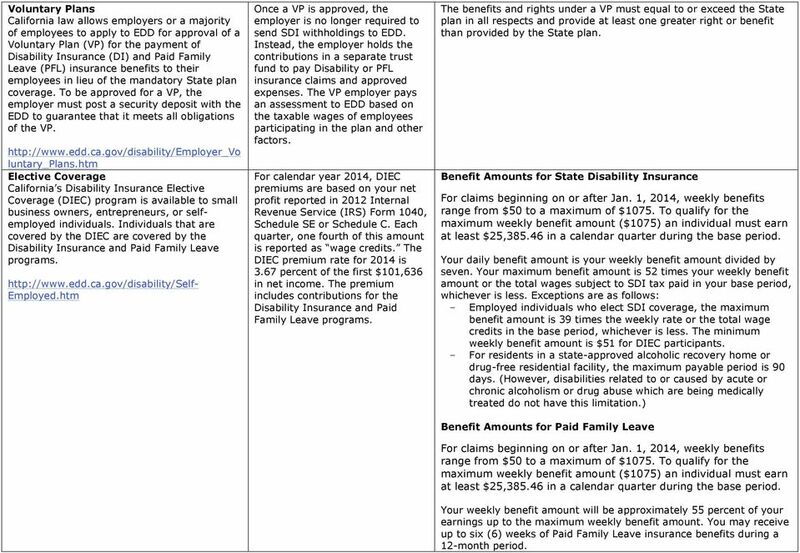 For claims beginning on or after Jan. 1, 2014, the maximum weekly benefit is $546. If the employer has a sick leave plan which differs from statutory benefits and has been approved by the Division as an equivalent or better-than-statutory plan, the weekly benefit amount, duration of payments, and whether or not a waiting period is required will be determined by the plan. 4 New Jersey State Temporary Disability Insurance (TDI) All New Jersey employers covered by the Unemployment Compensation Law are also subject to the Temporary Disability Benefits Law with the exception of certain government entities. A subject employer is automatically covered under the State Plan unless workers are covered under an approved private plan for temporary disability benefits. A claimant must have had at least 20 calendar weeks in covered New Jersey employment in which he/she earned $145 or more (called "base weeks"), or have earned $7,300 or more in such employment during the "Base Year" period (the 52 weeks immediately before the week in which the disability began). Only covered wages earned during the base year period can be used in determining a claim. Benefits may be limited if the employee does not meet certain eligibility requirements, has benefits from another source, or continues to be paid by the employer while disabled. Private Plan Coverage The Temporary Disability Benefits Law allows employers the option of choosing to establish a private plan for the payment of temporary disability benefits in place of paying benefits under the State Plan. All private plans must be approved by the Division of Temporary Disability Insurance. Both New Jersey workers and employers contribute to the cost of temporary disability coverage. Cost to Workers For 2014, workers contribute 0.38 percent on the first $31,500 (taxable wage base) in covered wages earned during this calendar year. The maximum worker contribution for 2014 is $ This contribution is in the form of a salary deduction that the employer takes from weekly wages. Cost to Employers Although the taxable wage base is the same as for workers, the contribution rate for employers varies from 0.10 percent to 0.75 percent. For 2014, employers contribute between $31.50 and $ on the first $31,500 earned by each employee during this calendar year. On January 1 of each year, the taxable wage base changes. Neither the employer, nor their workers are required to contribute to the State's Temporary Disability Insurance Trust Fund while the private plan remains in existence. The cost to the worker for the private plan cannot be more than it would be under State Plan. Weekly Benefit Rate (WBR) Your weekly benefit rate is calculated using your average weekly wage. The average weekly wage is generally based on the earnings in the eight calendar weeks immediately before the week in which the disability begins. The total wages earned during all base weeks worked in the eight week period are divided by the number of such base weeks to obtain the average weekly wage. Each claimant is paid two-thirds (2/3) of his/her average weekly wage up to the maximum amount payable set for that calendar year. The maximum weekly benefit rate is $595 for disabilities beginning on or after Jan. 1, Maximum Benefit Amount (MBA) The maximum benefit amount which may be paid for each period of disability is one-third (1/3) of the total wages you earned in New Jersey covered employment during the base year, or 26 times the weekly benefit amount, whichever is less. At a minimum, approved private plans must meet the basic provisions required of State Plan. Under a private plan: - Benefits paid must be at least equal to the amount that would be paid on a State Plan claim. - Eligibility requirements cannot be more restrictive than they would be for a State Plan claim. - Coverage must be at least equal to the coverage offered by the State Plan. vate/pp_emp_menu.html If employees are to be required to contribute toward the cost of the plan, a written election must be held and a majority of employees must agree to the plan prior to the effective date of the plan. 5 Disability During Unemployment Program If a worker becomes totally disabled and has been out of New Jersey covered employment for more than 14 days, he or she may be eligible for benefits under the Disability During Unemployment program. Claims filed under this program are governed by both the Unemployment Compensation and Disability Benefits Laws. However, it is essential to remember that they are primarily unemployment insurance claims, established under Section 4(f) of the Unemployment Compensation Law. To be eligible for benefits, the claimant must meet all the requirements of this Law, and become totally unable to work. The claimant must also be under the care of a legally licensed physician, dentist, podiatrist, optometrist, chiropractor, psychologist, certified nurse midwife, or advanced practice nurse. In order to have a valid Disability During Unemployment claim, the claimant must have been paid a minimum amount of wages while in a job covered by New Jersey's disability insurance program during the base period of the claim. Employment with local governments that have not elected disability coverage for their workers is not covered for disability benefits nor is out-of-state employment, even though it is covered for unemployment insurance. u/ddu_emp_menu.html Disability During Unemployment benefits are subject to federal income tax. Upon the claimant's written request, a federal income tax deduction at the rate of 10 percent will be made. All benefits received under the Disability During Unemployment program are considered taxable for federal income tax purposes. At the beginning of the year the claimant will be sent a Form G which will include the disability benefits as well as any unemployment benefits they received during the previous calendar year. Benefits under the New Jersey Temporary Disability Insurance Program are not taxable for New Jersey State Income Tax purposes. Your claim will be processed using wages which your New Jersey employers have submitted to a centralized databank. Weekly Benefit Rate Your weekly benefit amount is 60 percent of your average weekly wage earned during your base period. For a disability that begins in 2013, the maximum weekly benefit rate is $624. Not everyone receives the maximum weekly benefit amount. If your weekly benefit rate is less than $624, your benefits might be increased if you have unemployed dependents. 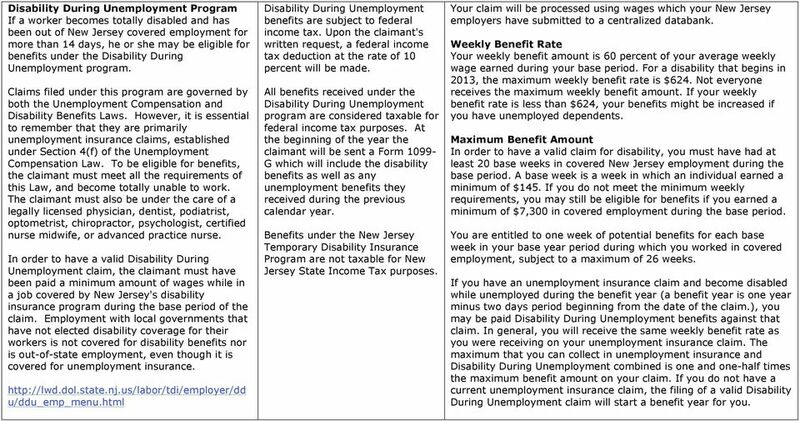 Maximum Benefit Amount In order to have a valid claim for disability, you must have had at least 20 base weeks in covered New Jersey employment during the base period. A base week is a week in which an individual earned a minimum of $145. If you do not meet the minimum weekly requirements, you may still be eligible for benefits if you earned a minimum of $7,300 in covered employment during the base period. You are entitled to one week of potential benefits for each base week in your base year period during which you worked in covered employment, subject to a maximum of 26 weeks. If you have an unemployment insurance claim and become disabled while unemployed during the benefit year (a benefit year is one year minus two days period beginning from the date of the claim. ), you may be paid Disability During Unemployment benefits against that claim. In general, you will receive the same weekly benefit rate as you were receiving on your unemployment insurance claim. The maximum that you can collect in unemployment insurance and Disability During Unemployment combined is one and one-half times the maximum benefit amount on your claim. If you do not have a current unemployment insurance claim, the filing of a valid Disability During Unemployment claim will start a benefit year for you. 6 New York Disability Benefits Law Employers must provide disability benefits coverage to employees for an off-the-job injury or illness. rs/employers.jsp Coverage for disability benefits can be obtained through a disability benefits insurance carrier who is authorized by the New York State Workers' Compensation Board to write such policies. Another option is for large employers to become authorized by the Board to selfinsure. Disability benefits = temporary cash benefits paid to an eligible wage earner, when he or she is disabled by an off the job injury or illness. The Disability Benefits Law provides weekly cash benefits to replace, in part, wages lost due to injuries or illnesses that do not arise out of or in the course of employment. Disability benefits are also paid to an unemployed worker to replace unemployment insurance benefits lost because of illness or injury. Disability benefits include cash payments only. An employer is allowed, but not required, to collect contributions from its employees to offset the cost of providing benefits. An employee's contribution is computed at the rate of one-half of one percent of his/her wages, but no more than sixty cents a week. Medical care is the responsibility of the claimant. It is not paid for by the employer or insurance carrier. Cash benefits are 50 percent of a claimant's average weekly wage, but no more than the maximum benefit allowed, currently $170 per week. Benefits are paid for a maximum of 26 weeks of disability during 52 consecutive weeks. For employed workers, there is a seven-day waiting period for which no benefits are paid. Benefit rights begin on the eighth consecutive day of disability. An employer must supply a worker who has been disabled more than seven days with a Statement of Rights (Form DB-2715), within five days of learning that the worker is disabled. 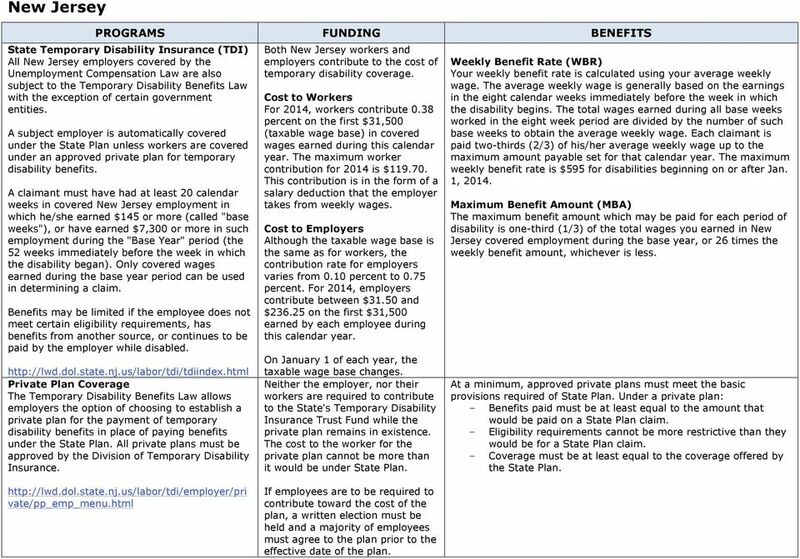 NJ State Disability Benefits (TDB) An Employer Guide to how a private carrier can improve claims processing and lower costs. Japanese Social Insurance (As of November 30, 2011) Japanese Social Insurance (2011) 1 Contents Page Japanese Social Insurance Programs 2 1. Employees Health Insurance 3 2. Nursing Care Insurance 5 3. LONG-TERM DISABILITY BENEFITS Revised September 1, 2004 No. 6 (*) 7000CI-U-EZ E O BENEFIT INFORMATION WHY LONG-TERM DISABILITY COVERAGE People tend to take their good health and ability to work for granted. SUPPLEMENT. to the WESTERN PENNSYLVANIA ELECTRICAL EMPLOYEES INSURANCE TRUST FUND SICKNESS AND DISABILITY BENEFITS PROGRAM. 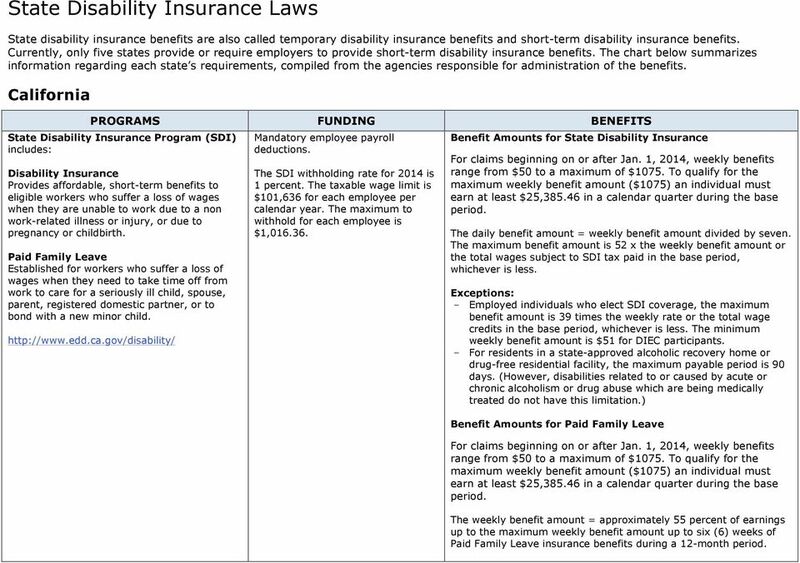 Your Guide to UC Disability Benefits Your Guide to UC Disability Benefits KEY DEADLINES WITHIN 31 DAYS OF BEING HIRED BY UC Enroll in Supplemental Disability now when you won t need a statement of health. LONG TERM DISABILITY INSURANCE CERTIFICATE BOOKLET GROUP INSURANCE FOR MONROE CO COMMUNITY COLLEGE SCHOOL NUMBER 704 TEACHERS The benefits for which you are insured are set forth in the pages of this booklet. GROUP SHORT TERM DISABILITY INSURANCE PROGRAM. EnerNOC, Inc.